When most think of Mego in the UK, their thoughts turn to Palitoy or Denys Fisher. Few have ever heard of Wiggins Teape or of their contributions to foriegn Mego collectibles but they are, quite noteworthy. The company started out as Wiggins Teape Stationary Ltd and distributed many fine art and crafts products such as "Das modelling clay" and card games. When they had great success with these items, they decided to venture into toys, namely boy's action figures and board games. 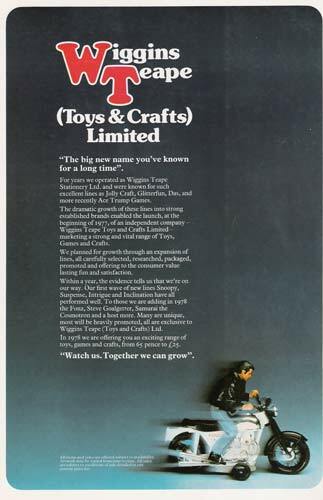 In 1977, "Wiggins Teape, toys and Crafts Ltd" was formed as an independant company with the slogan "The Big New Name you've known for a long time". What is most interesting to note is that their boys line is entirely made up of Mego products. Wiggins Teape not only distributed US Mego Fare such as Flash Gordon and the Happy Days Gang but created their own characters (ala Palitoy and Denys Fisher) with their Soccer (football) star Steve Goal Getter. The Wiggins Teape 1978 catalog is a wonderful piece of unexplored Mego history.